We're Off to the Gala! On March 9, 2016 representatives of FACE (Friends and Advocates for Catholic Education) sat in on question period at Queen's Park for their annual Queen's Park Lobby Day for Catholic Education. Several students from Catholic secondary schools across the region were invited to be a part of Lobby Day. The students went on tours of the legislature and were invited to meet with the Lieutenant Governor of Ontario, the Honourable Elizabeth Dowdeswell, OC, OOnt. The Simcoe Muskoka Catholic District School Board's own Student Trustee, Matthew Marin, and our Student Trustee Elect, Andrea Chiappetta, went to Toronto for the day to participate. For more information on Lobby Day. 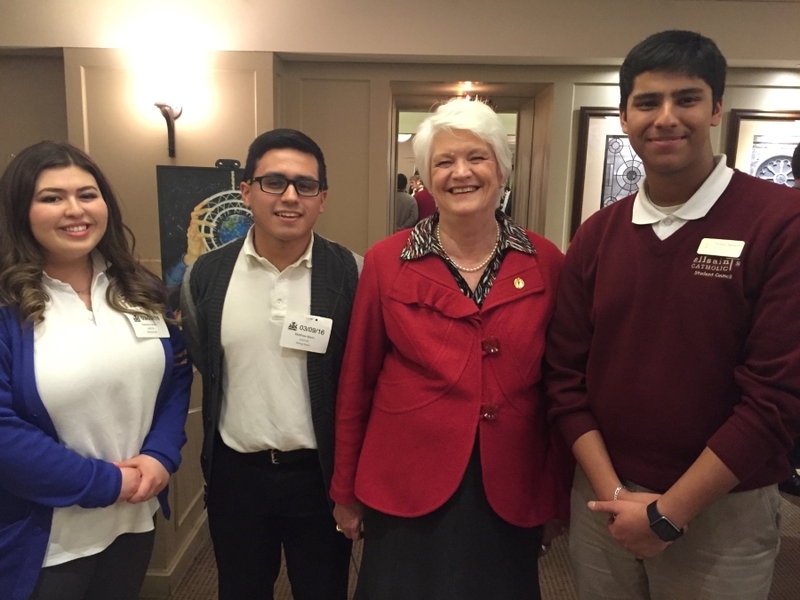 Minister of Education, Liz Sandals with Catholic school students (l.-r.): Natasha Iaboni, York CDSB; Matthew Marin, Simcoe-Muskoka CDSB; and Jordan Samaroo, Durham CDSB.